Gastrointestinal cancers such as pancreatic, bile duct and liver cancers are plagued by ineffective systemic therapies underscoring the tremendous unmet need for novel therapies. 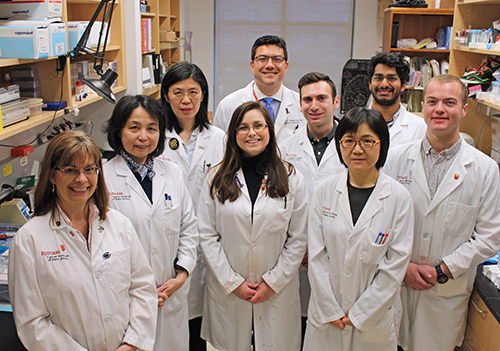 The Carpizo Laboratory studies cancer biology with an emphasis on developmental therapeutics. Our studies range from basic biology to provide clues for novel therapies, to translational research projects to move forward exciting new technologies for cancer treatment. TP53 is the most commonly mutated gene in human cancer for which no effective targeted anti-cancer drug exists. One area of focus is on developing zinc metallochaperones as effective mutant p53 targeted anti-cancer drugs. Our laboratory discovered ZMC1 (zinc metallochaperone-1), which is a small molecule drug that reactivates mutant p53 (PMID: 22624712). The paper was featured in Nature, Nature Reviews Drug Discovery and Cancer Discovery for its significance. ZMC1 and other zinc metallochaperones function to reactivate mutant p53 using a mechanism which involves the molecule binding zinc in the extracellular environment and moving intracellularly to increase zinc concentrations sufficiently to allow mutant p53 to undergo a conformation change to wild type. The pharmacologic delivery of a metal ion to restore wildtype structure of a mutant protein is unprecedented in the field of drug discovery and we have named this new class of anti-cancer drugs, “Zinc Metallochaperones.” (PMID: 25294809), Figure 1. We are currently are funded by the National Cancer Institute and multiple foundations (Breast Cancer Research Foundation, Pancreatic Cancer Action Network) as well as the biotechnology industry (BioMotiv) to continue this research. Another focus of the lab is the study of the biology of cancer recurrence or othwerwise known as metastatic dormancy. One of the most significant clinical problems in oncology is the recurrence of cancer following an attempt at curative surgery where the patient is disease free for some period of time (sometimes many years) before suffering a recurrence of their cancer due to the activation of “dormant” metastatic cells. This is best exemplified by pancreatic cancer where recurrence is over 75%. Therapies for recurrence are often ineffective indicating a tremendous need for research. Unfortunately this field of cancer research is only in its infancy due to a lack of mouse models that recapitulate recurrence. We have established several mouse models of dormancy in pancreatic cancer using both orthtopic cell injection and spontaneous genetically engineered models. We are engaged in studies to characterize these cells from a cell and molecular standpoint and to understand the mechanisms of tumor cell dormancy. Darren Carpizo completed his MD from the University of Illinois at Chicago in 1997 before moving to the University of California at Los Angeles where, during a nine-year period, he completed an internship and residency in surgery as well as a PhD in molecular, cell and developmental biology (2003). He completed his PhD in the STAR program (Specialty Training in Advanced Research), which is a unique program to train physician scientists under the mentorship of Dr. Luisa Iruela-Arispe studying tumor angiogenesis. He later went on to complete a surgical oncology fellowship at the Memorial Sloan-Kettering cancer center where he specialized in the management of patients with pancreatic, liver and bile duct cancers. There he published one of the first papers published on the surgical management of patients with hepatic and extrahepatic colorectal cancer metastases. 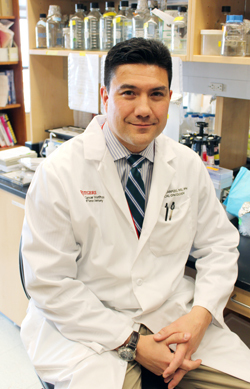 In 2008, he was appointed Assistant Professor of Surgery at the Rutgers Robert Wood Johnson Medical School and a member of Rutgers Cancer Institute of New Jersey. From 2008 to 2013, Darren worked under the mentorship of Dr. Arnold Levine (co-discoverer of p53). During this time he made a significant contribution to the p53 and drug development fields. They discovered a small molecule that could restore the wildtype structure and function to the most common p53 mis-sense mutant in human cancer, p53-R175H (Yu et al. Cancer Cell 2012). Darren has since gone on to establish how own lab that went on further to elucidate the mechanism of action of this drug which he and his colleagues have named a “Zinc Metallochaperone”. This discovery was significant for it identified a new pathway by which drugs could correct a folding defect in a metalloprotein such as p53 by delivering a metal ion. This mechanism is unique to the field of drug discovery. He has since garnered four peer-reviewed grants from a range of foundations and institutions including the National Cancer Institute to continue this research. In 2014 Dr. Carpizo was appointed jointly to the faculty of the Department of Pharmacology and is a member of the Cancer Institute of New Jersey’s Clinical Investigations and Precision Therapeutics and Cancer Pharmacology programs. He was promoted to Associate Professor of Surgery at the Rutgers Robert Wood Johnson Medical School in July 2015. Dr. Carpizo also continues to mange patients with gastrointestinal cancers and is the leader of the Cancer Institute's Liver and Bile Duct tumor study group.